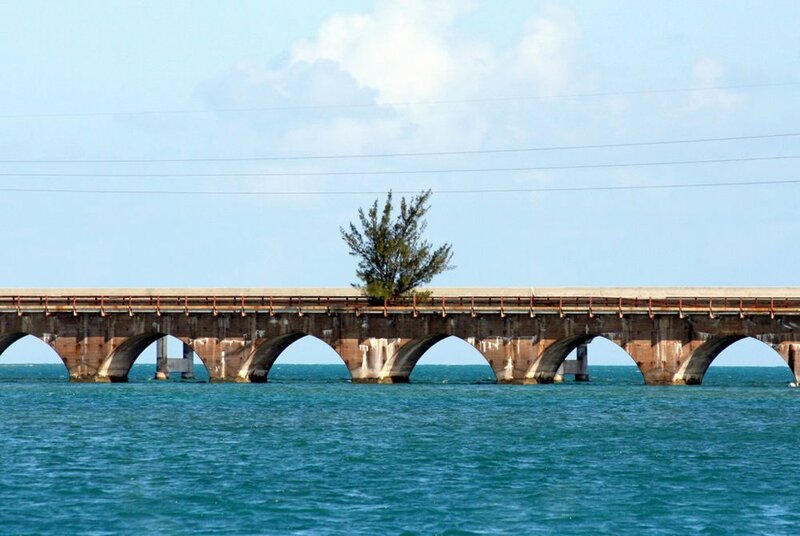 Affectionately nicknamed "Fred," this sturdy but unexpected tree has grown and flourished in the roadbed of the Old Seven Mile Bridge. Fred is a salt-sprayed Casuarina, or an Australian pine tree. 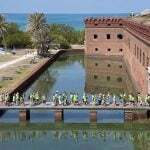 He’s growing out of a roadbed on the historic Old Seven Mile Bridge — completed as part of the famed Florida Keys Over-Sea Railroad in the early 1900s — which parallels the newer bridge used by motorists today. Other post-Irma survivors can be found throughout the Keys. 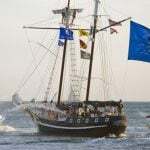 By just three weeks after the storm the Key West and Marathon airports were open as usual, and the Port of Key West was hosting cruise ships again. The Florida Keys Overseas Highway had passed inspection and its expanse (including, of course, the contemporary Seven Mile Bridge) was easily drivable throughout the 125-mile island chain. 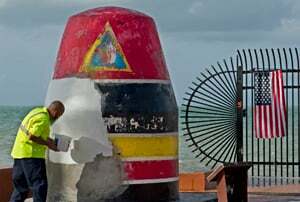 Even Key West’s Southernmost Point marker, an iconic photo stop for visitors that designates the continental United States’ southernmost land mass, was being repainted after damage from Irma. While Key Largo and Key West were least affected by the storm’s wrath, a number of lodging properties and other tourism facilities in the Keys haven’t yet resumed normal operations. 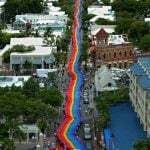 Recovery efforts are ongoing, especially in the hard-hit Lower Keys and parts of Marathon. 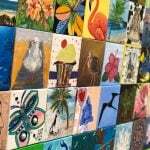 But the Keys’ people are stronger than Irma’s winds — as demonstrated Oct. 1, when the island chain reopened to visitors as a significant step in the continuing recovery process. And that’s where Fred comes in. A non-native species, the unexpectedly sturdy tree symbolizes the strength of Keys residents who are making significant progress in restoring what Irma tried to blow away. Each December Fred’s habitat, shown here from the water below, is decorated with festive lights to create a Keys-style symbol of the holiday season. According to a 2013 story in “Keys Weekly,” Fred may have sprouted from droppings of a passing bird or an osprey. And despite the apparent lack of friendly soil, the tree has grown tall and lush in the sun-seared, salt-swept landscape of the old bridge. The weather-beaten span has long been closed to motorists (and even pedestrians). So Fred is “only reachable by parachute, jetpack or by scaling a 100-year-old pylon from a boat bobbing in the water more than 20 feet below the roadbed,” the story states. A smaller tree just to the south has been dubbed “Fred Jr.” (though some people insist it’s Fred’s companion Wilma). In fact, defying natural logic, several bushes have also sprouted on the cracked pavement and somehow managed to thrive. For many Keys residents, they’ve become leafy mascots. But Big Fred is the best known by far. 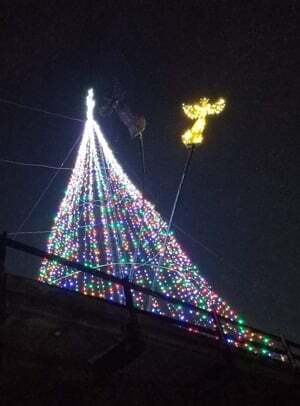 During the December holidays, locals decorate his habitat with lights — eliciting smiles and an upsurge of seasonal cheer in virtually everyone driving across the modern Seven Mile Bridge after dark. 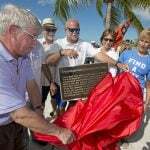 This, you see, is how Fred inspires Keys residents as they continue cleanup and restoration.